This vintage style necklace features a replica of the historic map titled, The United States of North America, with the British territories and was created by William Faden in 1793. 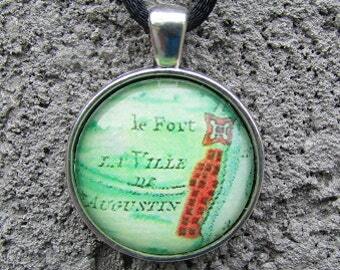 The portion of the map used for this necklace depicts the Chesapeake Bay. The original map was hand-drawn and colored in beautiful tan, orangish-brown and black. 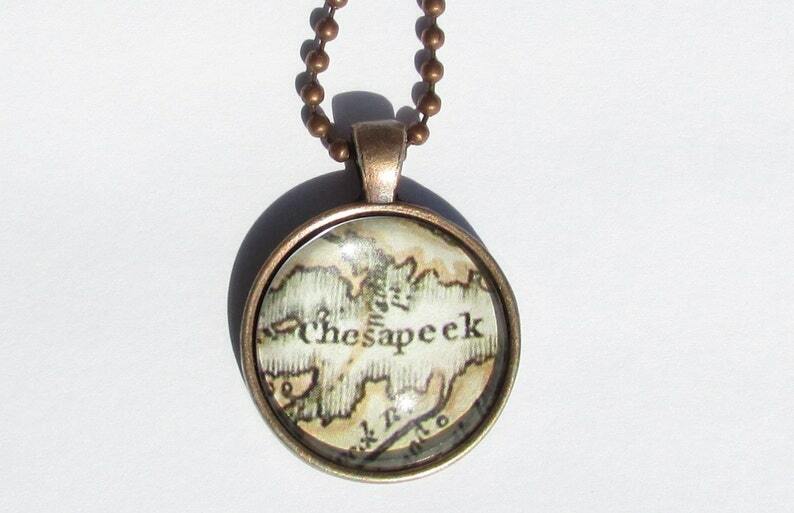 The map replica is set in a circular antique-style copper pendant tray. The pendant measures approximately 1 inch across and hangs from an 18 inch copper ball chain. The back of the pendant tray also has a detailed pattern. The finished glass cabochon is domed shaped and magnifies the image. Please note: There is a small shadow on the bottom portion of the pendant.